Lots of hustle and bustle this week. I am so glad that I decided to take the week off work. The monstrous to-do list I made is getting … longer! For every task I accomplish, I have been adding at least three more. Mother’s Day evening one of the goats got caught in his fence. My youngest son discovered the awful scene. We had to meet the vet at the clinic for treatment. Luckily, I am home this week for the TLC the little goat needs. One of the treatments is hot compresses with Epsom Salts. Funny in a way (or maybe just nostalgic) because most of our wounds as kids, Mom and Dad had us treat with Epsom Salts soaks. My oldest son is home from college. My youngest son is graduating high school Saturday. The oldest started his full-time, summer job yesterday as the youngest had his last day of HS on Tuesday. The house has been full of activity and schedule changes. Keeping the fridge and pantry stocked is not easy. Keeping the house clean? Might be impossible! The yard finally looks mowed instead of cut for baling. The 4-wheeler is running. Life is good. Speaking of the 4-wheeler, Pig-farmer and I rode it to the pond at my Mom’s to check on the summer-prep progress of my son and friends. It looks great, by the way, but I didn’t think to take pictures. Hunter, the big ol’ lab, was hanging with the boys, but decided he would follow us back home. I said, he’s too old to run that whole way. So, Pig-farmer loaded the 100+ pound dog onto the back of the 4-wheeler with me for the ride home. Hunter used me as his “back-stop.” My abs got a good workout as I fought falling off the back as Hunter leaned against me, enjoying the ride. Yes, we got a few funny looks from people we met on the road. I’m sleeping the sleep of a physically tired person at night. I’m looking forward to time with my brother and the family, as a whole, this weekend. I am also prepping for tonight’s presentation at our Chamber’s annual meeting. The title is, “Everything I know about business, I learned on the farm.” Today = practice, practice, practice!! The animals are maybe a little spoiled. I have taken time to give treats in the morning and linger during the morning chores. Poor Saint … a fly kept annoying him during his early-morning nap! 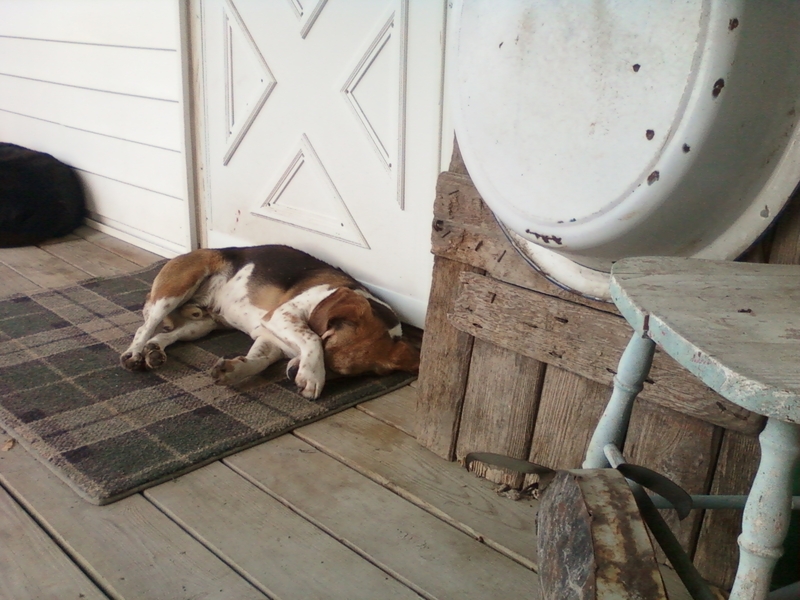 This entry was posted in Country Living, Friends and Family, Parenting, Work/Career and tagged 4-wheeler, beagle, Boer goats, coffee, Country life, Epsom salts, family, farm, front porch, Life is good, ol' black lab, Pig-farmer, pond, sons, Speaking. Bookmark the permalink. Great to have you visit … and Good Morning, to you! I enjoyed my visit, thanks for showing us around. The tractor journey sounds hilarious. Labs can lean pretty hard! Thanks for visiting! I’m looking forward to reading your blog. What a pretty view! Flies drive us all crazy. 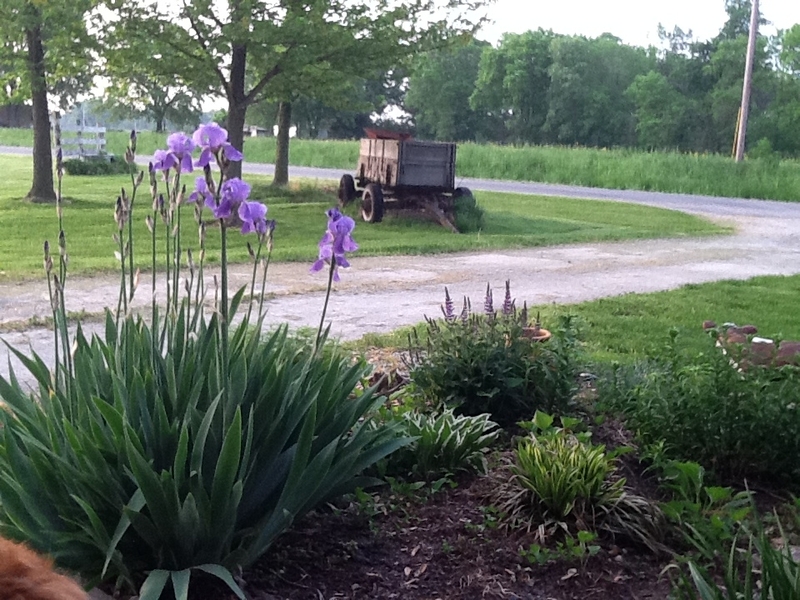 I am excited to clean out and mulch that flower bed this weekend! The flies … are just beginning … and when you have livestock around, they are worse! Thanks for reading. I am envious of your irises. Really envious.